Baked Cod has always been a favorite fish of ours. We prepare it so many ways but this one is the one we make most often. 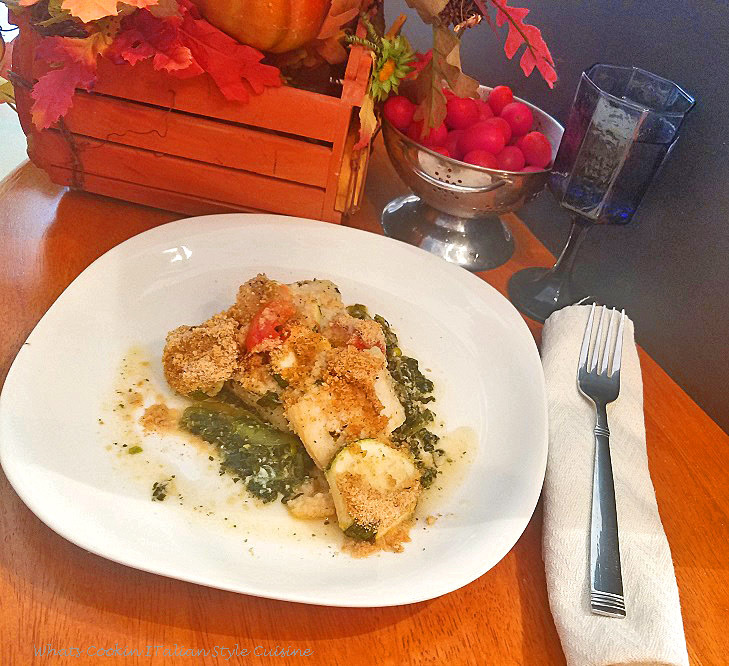 This baked cod fish is topped with a Parmesan crust and a delicious mound of roasted vegetables with toasted bread crumbs on a bed of sauteed spinach. It truly is a delightful recipe, scroll down and see why, it's tops in our home. Any white fish will do well that's hardy. I am a huge seafood lover and living in Florida, we are lucky to get fish very fresh most of the time. My husband loves to go surf fishing at the beach and has caught many delicious kinds of fish. Cod is a Northern fish and being from Upstate New York a favorite. 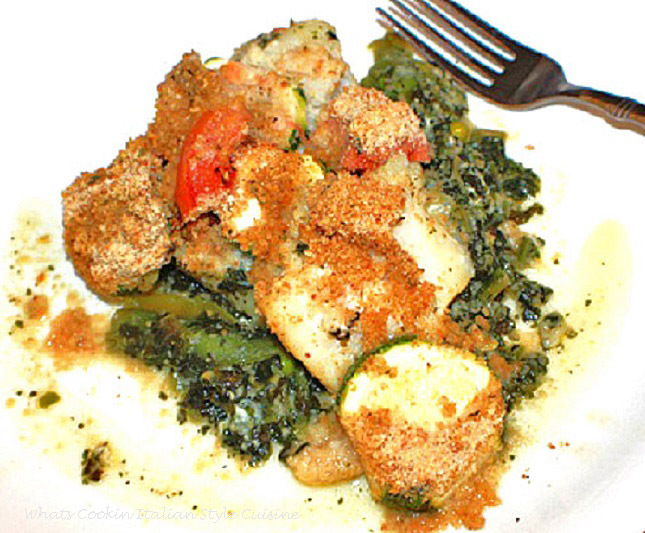 We often use fresh flounder or snook in this recipe when he gets a good day fishing. Use easy cooking vegetables when making this dish. Fish cooks quickly and you want to make sure the vegetables are done with the fish. I don't recommend potatoes unless they are cooked first. Peppers and onions do well with this dish also. When I cook this fish I love the tomatoes sliced very thin so I use a mandolin to slice them. They cook quickly and taste great with the Parmesan toasted bread crumbs. We just love tomatoes roasted. Any squash I've used cooks quickly roasted. Yellow, green work very well with this cod dish. I don't recommend butternut squash unless you par boil it first and the added sweetness doesn't compliment the cod very well. Here's how I cook my spinach. I use fresh spinach mostly always. Add a few tablespoons of olive oil in a pan add a few cloves of minced garlic, saute until wilted, salt, pepper and a pinch of cayenne pepper. This time I also added around 1 cup of snap peas with the spinach and sauteed for around 10 minutes. 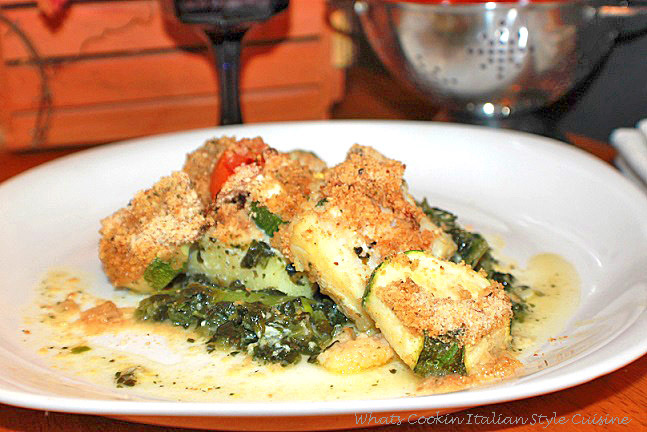 In our home especially at Christmas, we always have cod fish in sauce, called baccala. We also deep fry our cod in batter. This is the perfect summer and fall meal preparing this with roasted vegetables. Cod is one of those fish that's so versatile, you can use it for just about any recipe. If you like zucchini mushy, then slice it thinner, we happen to like ours when it's still a little firm and not too soft. Cutting them in thicker chunks will keep them soft but not over cooked. This is a question you can only answer. If you love dill, oregano, basil, parsley or any other seasonings for fish, adapt this recipe. Go ahead and substitute fresh lemon or lime juice, do so. This is a guideline to how I prepare this dish, change it any way you like. I love spicy and add more cayenne pepper to my spinach, omit it if you don't like spicy food. Please let me know how you love your fish, I would love to hear from you. The wine makes a big difference, taste it first, if you won't like the taste when drinking it, that will ruin the dish. That's my rule of thumb, if you like it, use it, always buy a good grade wine, I use Pinot Grigio. More expensive wines tend to taste better when cooking and avoid any kind of cooking wine, they are full of salt. If you live up North you can find fresh cod. We always use frozen since we can't get it fresh. However you can use other fresh fish if you live in the South that you like. 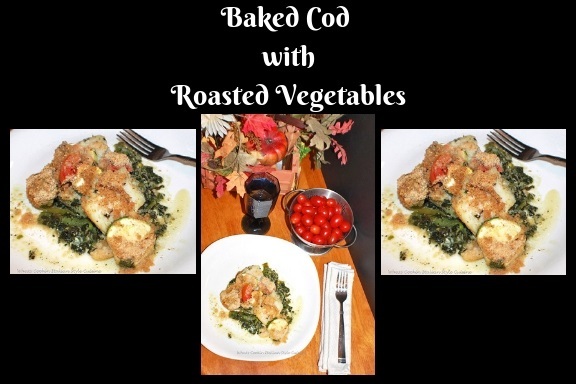 This baked cod with roasted vegetables is a flavorful easy dish that any seafood lover will appreciate. 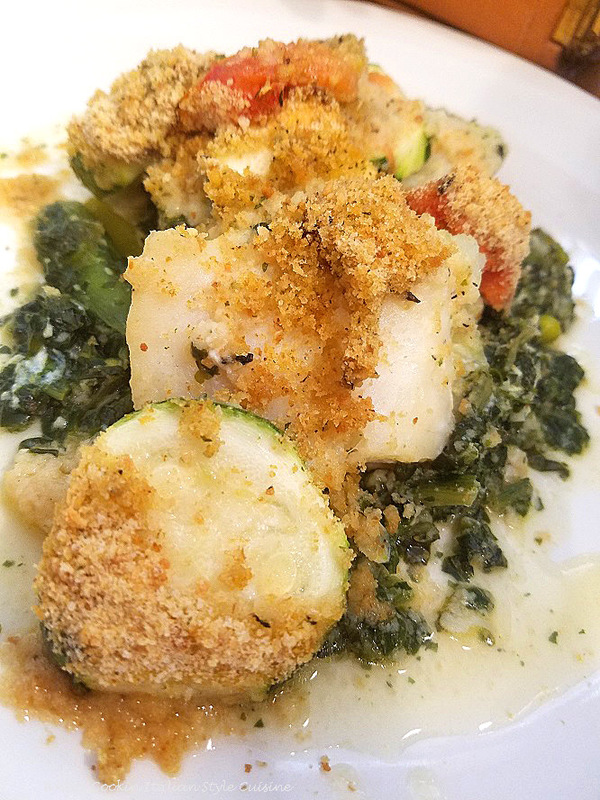 The cod is just bursting with delicious flavors and the toasted bread crumbs with Parmesan are the perfect combination on top. In a medium sized fry pan saute the spinach with 3 tablespoon of oil and the garlic. Add the snap peas. Oil spray a casserole baking pan 9 x 9 or larger. When spinach is wilted add to the casserole dish. Place filet's on the top of the spinach. 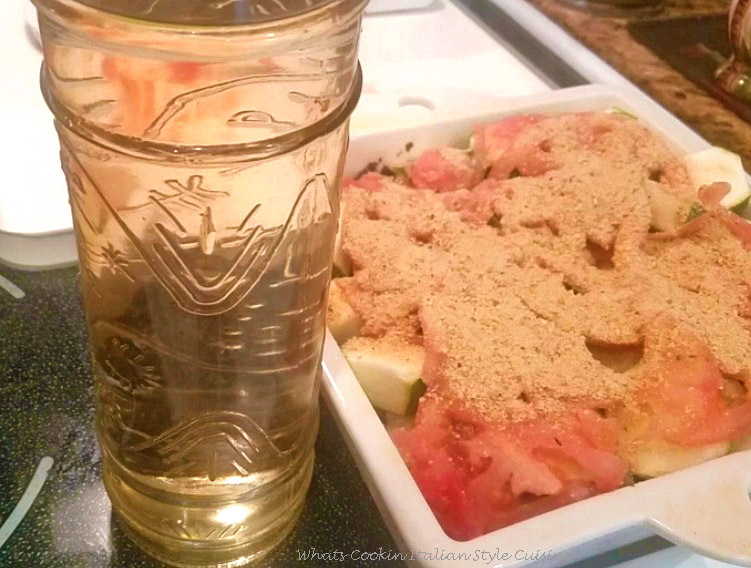 Add zucchini slices, sliced tomatoes. 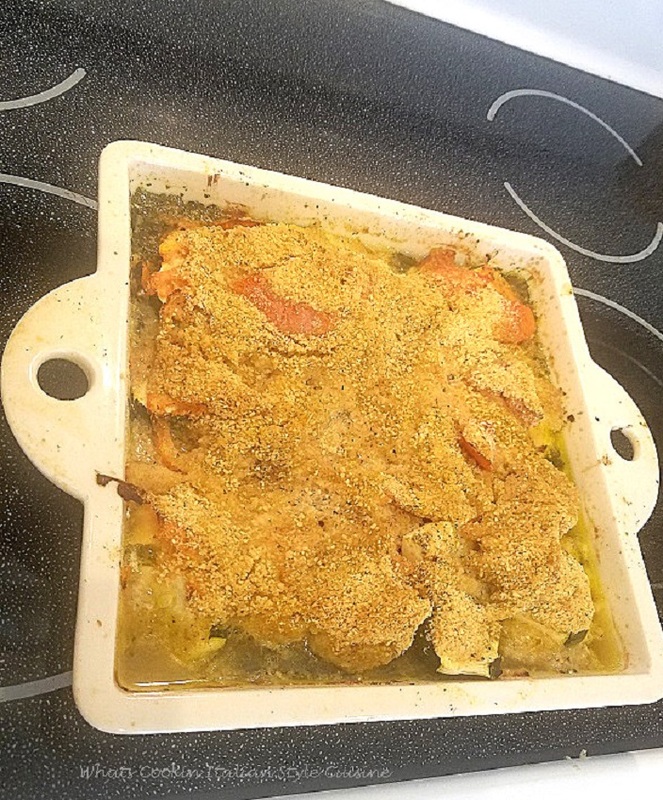 Sprinkle evenly over the tops with the Italian flavored bread crumbs, Add the Parmesan cheese evenly, herbs, salt pepper to taste and cayenne pepper and any other herbs you would like to use. Carefully pour wine around the bottom of the pan not touch the toppings. Drizzle with a little olive oil or melted with butter and more cheese if you like. Bake on 350 degrees, hot oven until the tops are browned around 35 to 45 minutes. 20 comments cod, Fish, roasted vegetables, seafood, video. Such a yummy and healthy meal! This would be a meal that my family would love! I really don't use cod as much as I should as it makes a great easy meal, especially in simple tasty combinations like this. 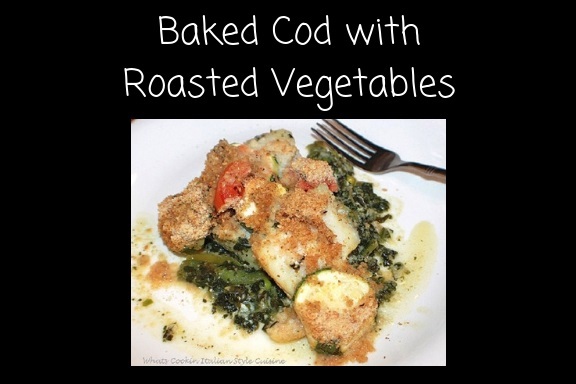 We don't eat as much fish in my house but we do love cod and of course it is best with lots of fresh roasted veggies. Looks delicious. Cod is such an unappreciated fish, but it's really delicious. I've never tried it like this, so looking forward to enjoying it in a new way! I love cod fish! Particularly when it is cooked with zucchini with some spinach and peas! That sounds amazing. And the fact that you also used Parmesan and white wine is incredible! Oh, boy, this is such an elegant delicious meal, Claudia! Well done! I had cod a restaurant over the summer and loved it! Now, I want all the cod recipes! This one looks delicious and my whole family will love it! My family loves zucchini, so it's a great recipe for me. Love everything about this recipe! That looks mighty tasty! I can not wait to try it. Yum! We eat a lot of fish also. And poor Hubby is dying to get to his shore fishing too but it's going to be a while before we can get away. So in the meantime we do eat a lot of cod as well as tuna, and wild-caught salmon. 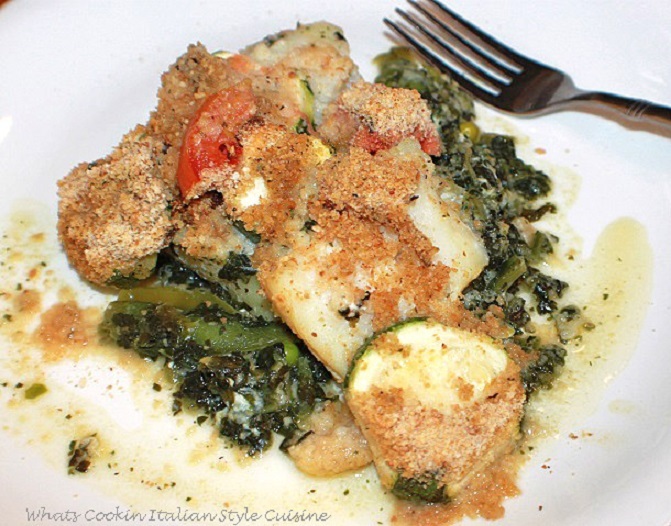 Your cod looks delicious -- have you tried it with a puttanesca sauce on it?? It's great too. I would love it with olives but my husband hates them, puttanesca sauce is a favorite of mine, my mom made it all the time and added shrimp to it was my favorite sauce for pasta! During a trip to New England several years ago, I discovered that I really like fish baked with a bread crumb topping - looks good from here. I love baked fish very much. This sounds so incredibly simple and easy. Roast veggies are always perfect with fish. My husband would think he was in heaven if I made this for him! 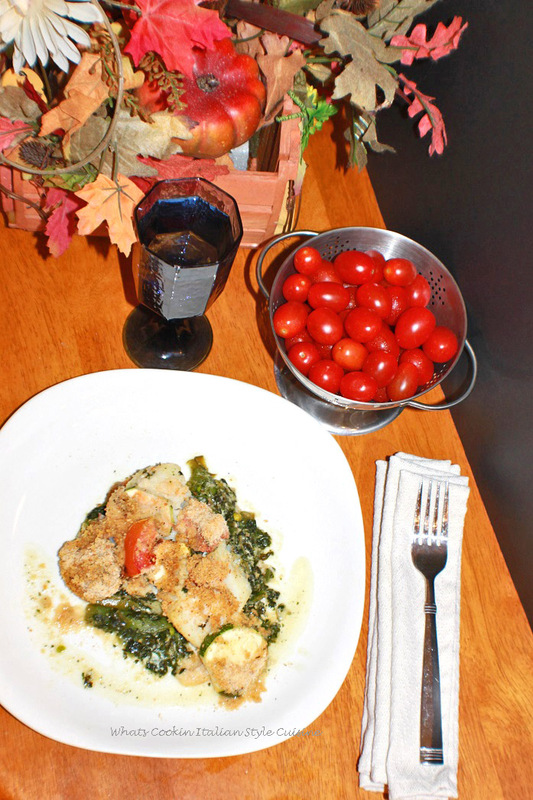 He loves fish, and baking cod is such a great way to prepare it. 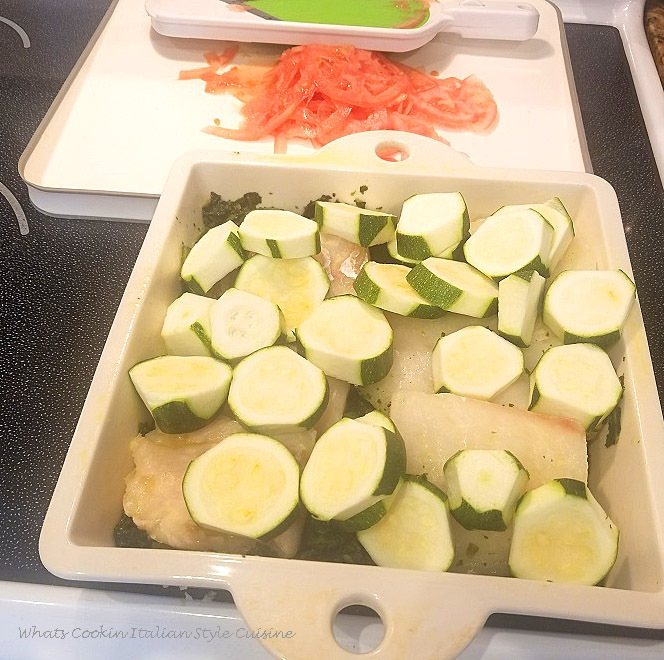 Cod is one fish I couldn't get any flavors in your recipe sounds delicious, Love that it is wholesome meal with veggies and fish. I like crispy top with breadcrumbs on the top. This looks beautiful. I bet the taste is even better! 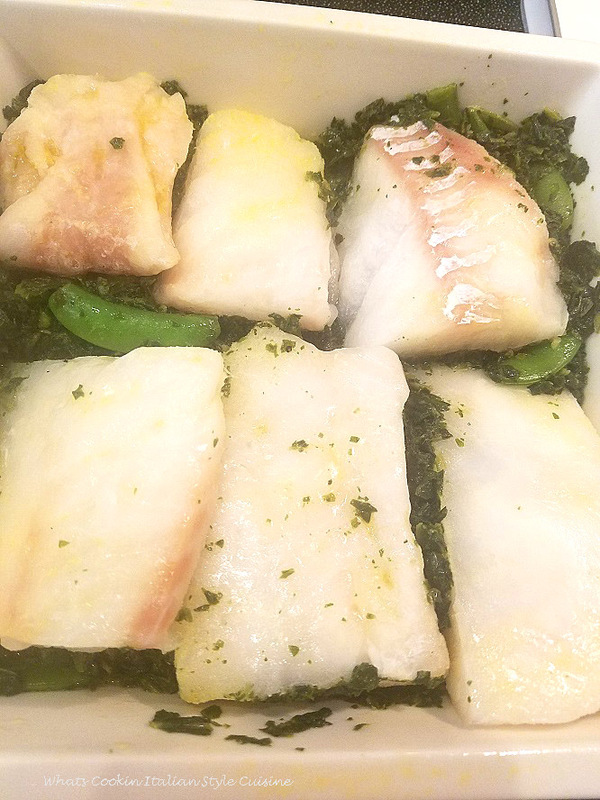 I love a good heart white fish like cod and the snap peas take this over the top for me in the best way! What a delicious-looking meal! 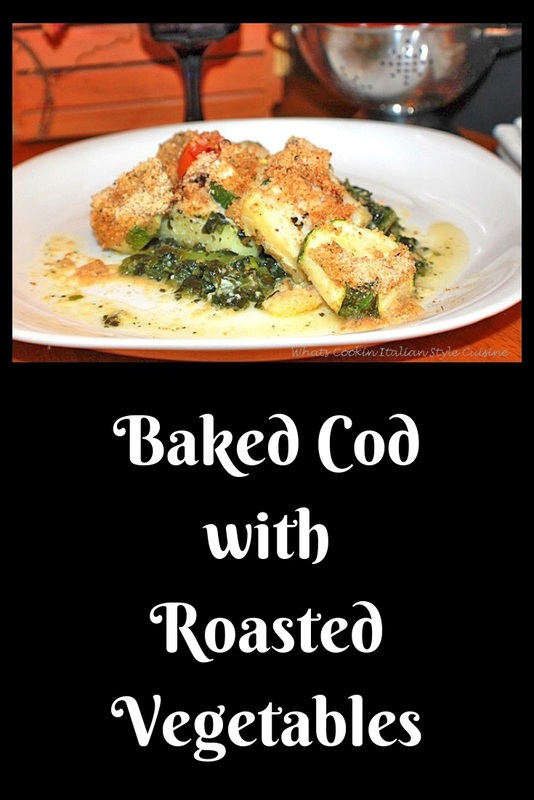 I love that this baked cod recipe is easy to make. It's a perfect mid-week meal.